Atlas Air Worldwide ($AAWW) and Air Transport Services ($ATSG), are two stocks worth keeping an eye on for the next few quarters because of their recent partnership with Amazon. 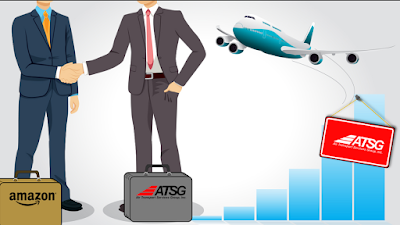 On that news, ATSG was up as much as 24% the next day and closed up 16% on the news. Since then the stocks has digested the gains by trading sideways. On 5/4/2016 Atlas Air Worldwide signed a similar deal; “Amazon (AMZN) and Atlas Air Worldwide (AAWW) have inked a long-term air cargo services deal that gives the e-commerce titan the rights to acquire up to a total of 30% equity of the outsourced aircraft provider as Amazon fortifies its delivery capabilities. The deals, which involve 20 B767-300 converted freighters, go into effect in the latter half of the year and will “ramp up to full service through 2018,” said Atlas Air. These include 10-year dry leases by its Titan Aviation leasing unit and 7-year crew, maintenance and insurance operations agreements. Atlas Air Worldwide was up as much as 50% the next day on the Amazon news and closed up 26%. Since then the stock has settled down, and volatility has contracted. There’s no doubt that these two stocks will be huge benefactors from Amazon’s dominance in the retail world for many quarters to come.